It is with extreme regret that we announce the cancellation of the 2012 Railroad Revival Tour. The decision to do so was a difficult one, but it was determined that certain complications would not permit us to host the shows in the manner intended, and that the bands and fans deserved. Ticketholders will be receiving a full refund for all costs. All refunds are being processed and appear on your credit card statement. These will be fully processed by October 21, 2012. We hope fans will take the opportunity to see these acts in other venues. Thank you. 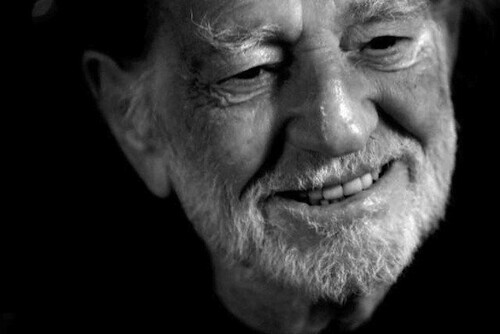 Willie Nelson is going on the road again — with his fans. Band of Horses, Jamey Johnson, John Reilly & Friends and other performers join him on stage next month for a series of concerts from Duluth, Ga., to Oakland. Folks can ride along on seven individual legs of the Railroad Revival Tour 2012 by buying tickets that come with a sleeping berth, concert tickets and some VIP perks, too. The private rail tour begins Oct. 19 in New Orleans and shuttles to Duluth, home of the vintage Southeastern Railway Museum (you get a private tour) and the first concert stop. Travelers get to sit in on a preshow sound check with Nelson and the bands, sip cocktails in a VIP area and watch the show before returning to New Orleans. The last run starts in San Pedro on Oct. 27 and travels to Oakland. The package includes tickets to concerts in both venues, on-board musical performers and one-way travel to the Bay Area. Sleeping options include private bedrooms, roomettes or dorm-style cars. When: The tour runs from Oct. 19 to 28. Passengers may book the package for concerts in Duluth, Ga. (starts and ends in New Orleans); Memphis; Oklahoma City; Old Town Spring, Texas; Tempe, Ariz; before the final run from San Pedro to Oakland. Price: $695 to $795 per person, double or multiple occupancy. It includes concerts, sleeping berth, meals aboard the train and other extras that vary by city. Rail travel (except for New Orleans) is one way; participants make return travel plans on their own. The RailRoad Revival Tour’s FaceBook page is giving away tickets to see Willie Nelson, Jamie Johnson, and more, on the upcoming Railroad Revival Tour. To enter, leave a comment on their page, stating what you think The Willie Way is. Last year’s inaugural Railroad Revival Tour (featured in the movie The Big Easy Express) was just the beginning. 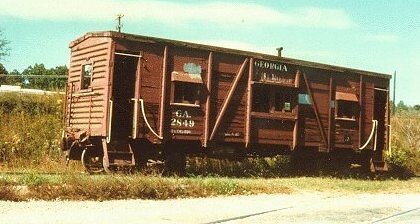 This year’s tour takes off from the Southeastern Railway Museum in Duluth, GA in October and brings WILLIE NELSON & FAMILY, BAND OF HORSES, JAMEY JOHNSON and JOHN REILLY & FRIENDS into town on vintage railcars for a truly unique musical experience. We’ve got a pair of tickets for these stops below, and we want you to go to the party. Enter to win and in the comments section BE SURE TO LIST WHICH STOP YOU’RE INTERESTED IN. All aboard! *contest ends 10/2 *contest open to US residents only. *This prize is for a pair of tickets ONLY. No lodging or travel is included. Follow this link to enter the contest. Country California is giving away tickets to the Railroad revival Tour here. Willie Nelson and Jamey Johnson crossing the country by train, playing songs for the folks as they stay one step ahead of villainous, black-hatted barbers? Sounds like the plot of an old western. Throw in the Band of Horses and musician-actor John Reilly (with friends Becky Stark and Tom Brosseau) and you’ve got the 2012 Railroad Revival Tour. Sound like a show you don’t want to miss? We don’t think you should have to. In fact, we’d like to see to it that you’re there. To that end, we’ve wrangled three (3) sets of tickets to any of the tour’s stops. The train’s running all throughout the Southern half of the country, so you have a good chance of finding a show within driving distance. For full background and tour details, see the Railroad Revival website. It’s a simple two-step process. Both steps are necessary to be eligible. 1) Make sure you’re following Country California and the Railroad Revival Tour on Facebook or Twitter. 2) Comment on this post with one favorite song by any featured performer. Entries will be accepted through next Friday, September 21 at 11:59PM Pacific Time. Winners will be contacted by email, so be sure to use a valid address when you leave your comment. The Southeastern Railway Museum in Duluth will be the first stop in October for a Railroad Revival Tour concert featuring country music legend Willie Nelson as the headliner. Also performing will be folk rockers Band of Horses, Grammy Award-nominated Jamey Johnson and actor-musician John C. Reilly and Friends. 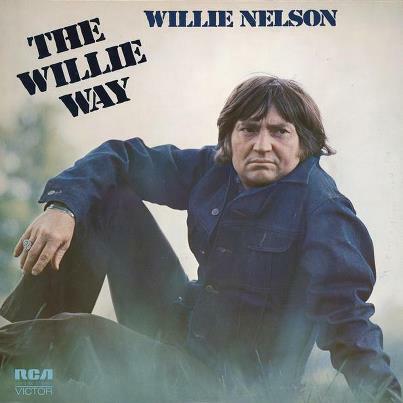 — What’s your favorite Willie Nelson song? 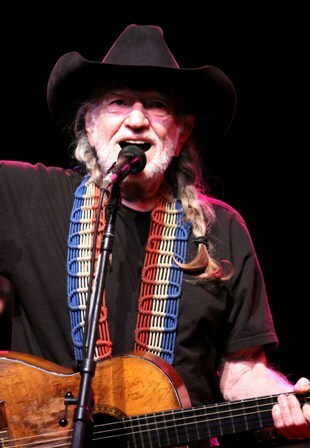 Have you ever attended a Willie Nelson concert? Tell us in the comments below. The Duluth City Council in a called meeting Monday (July 23) approved a special-use permit request by David Conway representing the Dripping Springs, Texas-based tour to allow loudspeakers to operate within 1,000 feet of residential areas near the railroad museum from 2 to 11 p.m. for the one-day concert. During a public hearing on the permit request, Duluth Planning Director Glenn Coyne said the conditions for approval included directing the loudspeakers away from the Palisades and Grove Park subdivisions. Letters were sent to the homeowners by the applicant notifying them of the concert, Coyne said. There were four telephone inquiries from residents, but no opposition, he said. City staff recommended approval of the permit with a list of conditions. Besides Duluth, the tour 2012 tour will travel to Memphis, TN; Old Town Springs, TX; Oklahoma City, OK; Tempe, AZ; San Pedro, CA; and Oakland, CA. Early bird discount $55 tickets go on sale at 11 a.m. (EDT) Friday, July 27. For more information click here. Last year’s inaugural concert traveled between Oakland, San Pedro, Tempe, Marfa, TX; Austin, TX; and New Orleans, LA. Featured performers were Mumford & Sons, Edward Sharpe and the Magnetic Zeros. All parking for the concert will be off-site. Tour organizers are negotiating to use a grass River Green lot and parking lots at Gwinnett Center and the Atlanta Athletic Club. Shuttle buses will provide transportation to and from the concert venue for ticketholders. Duluth Councilwoman Marsha Bomar suggested that “No Parking” signs be erected along Buford Highway to prevent concert-goers from parking there and that nearby merchants be informed about the concert. Willie Nelson is hitting the road in a most unconventional way. The country legend is headlining the second Railroad Revival Tour, a train outing that will travel between towns with the acts aboard 16 vintage 1940s rail cars and set up pop-up concert venues around the railroad tracks where they stop. The eight-day tour launches Oct. 20 at the Southeastern Railway Museum in Duluth. Joining Nelson are Jamey Johnson, Band of Horses and John Reilly and Friends (yes, the actor John C. Reilly). The concept originated last year with Mumford and Sons, Edward Sharpe and the Magnetic Zeros and Old Crow Medicine Show traveling to six cities. The shows were filmed for the documentary, “Big Easy Express,” available on DVD/Blu-ray. Early bird tickets for the Duluth show are $55 for general admission, $125 for the “collector’s bundle” and $245 for the “first class ticket package” (open bar included!). Tickets go on sale at 11 a.m. Friday at www.railroadrevival.com, where you can also get detailed information about each of the ticket options. The second annual Railroad Revival Tour featuring Willie Nelson and Band of Horses has been announced. Last year, Edward Sharpe & the Magnetic Zeroes, as well as Mumford & Sons, participated in the first annual Railroad Revival Tour. As a part of this particular tour, the bands traveled via railcars pulled by two locomotives to their shows. 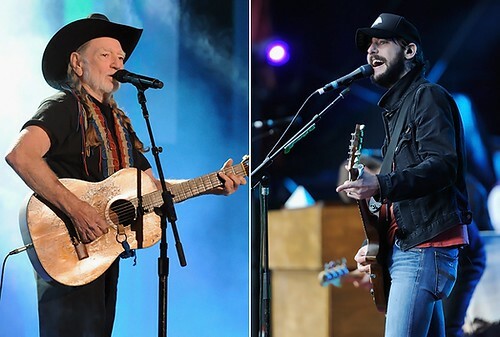 Willie Nelson, Band of Horses, John Reily & Friends and Jamey Johnson have confirmed to ride the train in October for the tour’s second round of shows. Beginning in Duluth, Georgia and ending in Oakland, Calif., the train will hit six different cities altogether. Nelson and Band of Horses will be showcasing new music while on tour; for Nelson, it will be his recently released solo album Heroes; as for Band of Horses, it will be from their upcoming LP, Mirage Rock, which is due Sept. 18. 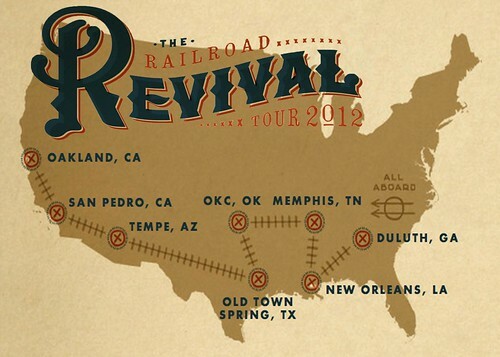 Below, find the tour schedule and the trailer for last year’s Railroad Revival Tour. Tickets go on sale July 27 at 10:00 AM CST.